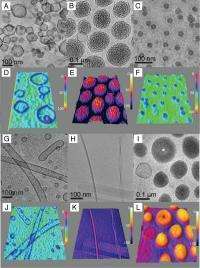 The research provides the first description of the preparation, structure, self-assembly and mechanical properties of vesicles and other selected complex nano-assemblies made from Janus dendrimers. The so-called dendrimersomes are stable, bilayer vesicles that spontaneously form from the exact chemical composition of Janus dendrimers. The team reported a myriad of bilayer capsule populations, uniform in size, stable in time in a large variety of media and temperatures, that are tunable by temperature and chemistry with superior mechanical properties to regular liposomes and impermeable to encapsulated compounds. They are capable of incorporating pore-forming proteins, can assemble with structure-directing phospholipids and block copolymers and offer a molecular periphery suitable for chemical functionalization without affecting their self-assembly. Co-authors Virgil Percec of Penn's Department of Chemistry and Daniel A. Hammer of Penn's Department of Bioengineering, joined by Frank Bates and Timothy Lodge of the University of Minnesota, Michael Klein of Temple University and Kari Rissanen of the Jyväskylä University, in Finland, have chemically coupled hydrophilic and hydrophobic dendrons to create amphiphilic Janus dendrimers with a rich palette of morphologies including cubosomes, disks, tubular vesicles and helical ribbons and confirmed the assembled structures using cryogenic transmission electron microscopy and fluorescence microscopy. "Dendrimersomes marry the stability and mechanical strength obtainable from polymersomes, vesicles made from block copolymers, with the biological function of stabilized phospholipid liposomes," said Percec, the P. Roy Vagelos Chair and Professor of Chemistry at Penn, "but with superior uniformity of size, ease of formation and chemical functionalization." "These materials show special promise because their membranes are the thickness of natural bilayer membranes, but they have superior and tunable materials properties," said Hammer, the Alfred G. and Meta A. Ennis Professor of Bioengineering at Penn. "Because of their membrane thickness, it will be more straightforward to incorporate biological components into the vesicle membranes, such as receptors and channels." "No other single class of molecules including block copolymers and lipids is known to assemble in water into such a diversity of supramolecular structures," said Bates, the Regents Professor and Head of the Chemical Engineering and Materials Science Department at the University of Minnesota. Self-assembled nanostructures, obtained from natural and synthetic amphiphiles, increasingly serve as mimics of biological membranes and enable the targeted delivery of drugs, nucleic acids, proteins, gene therapy and imaging agents for diagnostic medicine. The challenge for researchers is creating these precise molecular arrangements that combine to function as safe biological carriers while carrying payload within. Janus dendrimer assemblies offer several advantages to other competing technologies for nano-particle delivery. Liposomes are mimics of cell membranes assembled from natural phospholipids or from synthetic amphiphiles, including polymersomes. But, liposomes are not stable, even at room temperature, and vary widely in size, requiring tedious stabilization and fractionation for all practical applications. Polymersomes, on the other hand, are stable but polydisperse, and most of them are not biocompatible, requiring scientific intervention to combine the best properties of both for nanomedicine. Dendrimersomes offer stability, monodispersity, tenability and versatility, and they significantly advance the science of self-assembled nanostructures for biological and medical applications.